This is “The Foundations Scale-Steps and Scales”, chapter 3 from the book Music Theory (v. 1.0). For details on it (including licensing), click here. In this chapter, we shall examine the small incremental distances called Tones and Semi-tones. More commonly labeled whole stepsAdjacent scale steps that have an intervening half step. and half stepsAdjacent tones, the smallest distance between tones in the current system of tuning., these foundation scale-steps serve as the building materials from which we construct sequential orderings of pitches called scalesA sequential collection of five or more pitches.. The construction of various scales shall also be examined, especially the Major Scale and the Minor Scale. Additionally, other important scale patterns will be shown. The Major scale and its attributes. The Minor scale and its attributes. Any initial discussion of scales inevitably centers around these two seven-tone scales employed in the composition of Common Practice music. Note that half steps occur between scale degrees 3–4 and 7–8. This is shown in pitches and the keyboard in Figure 3.2 "Major Scale, Keyboard and Pitches". This arrangement of whole steps and half steps is maintained for any major scale on any given starting pitch. Accidentals are used to modify pitches in order to retain this same arrangement of whole and half steps. Compare the samples below to the keyboard diagram. Observe the placement of whole and half steps on the keyboard that maintain the proper ordering. Observe that in each new octave species, some chromatic alteration is required in order to retain the same arrangement of scale steps. An alternate view of major scale construction is an examination of its constituent tetrachords (from the Greek: “four tones”). Observe that the arrangement of whole and half steps in the first tetrachord are identical to that of the second tetrachord. Both tetrachords are W-W-H separated by a whole step. Identical tetrachords (W-W-H) separated by a whole step. The keyboard diagram is another essential tool for familiarization and recognition of major scales. The visual reinforcement of whole step and half step placement will hasten the learning process. The individual scale steps have specific labels. These terms have come into general use, having their origins in early 18th-century theoryFrench composer and theorist Jean Phillipe Rameau employs versions of these terms in his seminal work Traité de l’harmonie (1728). Our current usage of these terms is adapted from this work. Figure 3.4 "Scale-step Labels" shows the major scale and its accompanying scale step labels. The first degree of any scale is called the Tonic pitch. This is the pitch that asserts itself over all the others in the collection, the pitch that our ear naturally seeks as being the strongest.These terms will be affiliated with chords in keys as well. The next strongest pitch is the fifth scale degree, the Dominant. It is considered to be the “polar opposite” of Tonic: whereas Tonic represents stability and sense of conclusion, Dominant represents instability and a sense of tension. The third scale degree lies halfway between these and so is labeled the Mediant. Dominant is five scale-steps up from Tonic. Five steps below Tonic is the fourth scale degree, labeled Subdominant. Since the Mediant lies three steps up from Tonic, three steps down is labeled Submediant (the sixth scale degree). The second scale degree is labeled Supertonic. Lastly, the most powerful melodic motion we respond to is the ascending half step, from scale degree seven to the octave. Our ear is compelled to resolve this Leading Tone. For this example, the pitches are identical to the Major scale example above, re-arranged from scale degree six. Figure 3.7 "Minor Scales on a; on c; Major Scale on C" shows the same Minor scale pattern, but constructed from the same starting pitch. Both are then compared to the Major scale. As with major scales, minor scales use accidentals to retain the same “shape” when starting on differing pitches. Major and Minor scales that have the same pitch content but different starting pitches are said to be relative to one another, for example C major and a minor. Major and Minor scales that have differing pitch content but the same starting pitch are said to be parallel to one another, for example C major and c minor. Go to the sixth degree (Submediant) of the Major scale. Re-order the scale content from that pitch. Go to the third degree (Mediant) of the Minor scale. We do not recommend the “three up or three down” method that is sometimes employed. This leads to confusion on the part of the student. Inevitably, the student will go down the wrong specific pitch distance, or will confuse which relationship is which direction. In order to discover the Parallel Major/MinorThe relationship between Major and Minor scales wherein they share the same starting pitch but different pitch content. relationship, simply construct major or minor from the same starting pitch. Relative and Parallel Major/Minor will extend to our discussion of keys in Chapter 4 "Key Sense, Key Signatures, and The Cycle of Fifths".When labeling scales it is customary to use upper case letter names for major and lower case letter names for minor. When hand-drawn, a dash is placed above the letter c only. This should not be used for other lower case letters. These relations commute from each form to the other: one speaks of Major and its relative Minor, or Minor and its relative Major. The same is true for the parallel relationship. Just as the Major scale has labels for its constituent scale-steps, these labels are also used for Minor scales. There is one notable exception: since the distance between scale degree seven and the octave is a whole step, it does not possess the same sensation of required resolution as its major counterpart (the Leading Tone). Therefore it is labeled Subtonic. Earlier, the Leading Tone was described as the most powerful melodic step that we respond to in terms of demanding resolution. This half step between scale degrees seven and eight is not present in the naturally occurring Minor scale. Beginning with its antecedents in early music, the minor sonority was routinely altered to address this perceived flaw. Composers chromatically raised the seventh scale degree in minor as a matter of routine in order to provide a more powerful melodic resolution. Additionally, this alteration affected the accompanying harmonies, engendering a more powerful harmonic resolution as well. This led to an additional, altered form of the minor scale. The original diatonic form of the minor scale is called Natural (or Pure) MinorThe naturally occurring diatonic “parent” version of the Minor scale.. Because of its implied harmonic consequence, the altered version (raised 7, or +7) is called the Harmonic Form of the Minor scale, or simply Harmonic MinorThe most commonly used and expected form of the Minor scale. It is altered from Natural Minor by raising the seventh scale degree to artificially create a Leading Tone.. The seventh scale degree is raised in this form of minor. Depending upon the starting pitch and the scale, this may use an accidental in the form of either a sharp sign or a natural sign. There are three instances of half steps in this form: 2–3, 5–6, and now +7–8. Because of the alteration the distance between 6 and 7 has been expanded to form a “step and a half.” This was considered to be a melodic “flaw.” While inherent and necessary to the form, it was considered to be “un-singable” and in need of correction in performance practice. This perceived melodic flaw in Harmonic minor, the “step and a half” between scale degrees 6 and 7, was subject to routine alteration as well. In order to eliminate this awkward gap, composers routinely raised the sixth scale degree as well as the seventh. Since this was done to correct the perceived melodic flaw, a third form of the minor scale came to be recognized, called the Melodic Form of the Minor scale, or simply Melodic MinorThe second altered version of the Minor scale. It is altered by raising both the sixth and seventh scale degrees.. Both the sixth and seventh scale degrees have been raised. Depending upon the starting pitch and the scale, this uses accidentals in the form of sharp signs, natural signs, or a combination of the two. The second tetrachord of this scale is identical to the second tetrachord of the Major scale. It is customary to revert to the Natural minor form when descending. This must be shown using the appropriate accidentals. In some melodic minor scales double sharp signs must be used to alter sixth and seventh scale degrees. When reverting back to Natural minor, a Natural sign followed by a sharp sign is used, not merely a sharp alone. Minor is considered to be only one entity. It is not appropriate to speak of “three separate minor scales,” as if they are inherently different species. Although one entity, minor has three distinct forms, Natural, Harmonic, and Melodic. These forms evolved to accommodate musical and compositional needs over the evolutionary history of Western music. Natural (or Pure) Minor has no Leading Tone. This was considered to be an inherent weakness or flaw. Harmonic Minor seeks to correct this weakness by raising the seventh scale degree, artificially creating a Leading Tone. This in turn generates a melodic flaw in the gap between scale degrees 6 and 7. This melodic flaw was corrected by raising the sixth scale degree (in the presence of the raised seventh scale degree). Since this yields a second tetrachord equivalent to its Major scale counterpart, this process is undone in its descending form by reverting to Natural Minor. Lastly, Harmonic minor is the expected, normal form of Minor used by composers in practical composition. Composers seemed to require the motion from the Leading Tone to the Tonic. Just as much, they seemed to favor the naturally occurring sixth scale degree, the Submediant, “falling” to the Dominant. In the study of music theory, expect to see, expect to hear, and expect to use the Harmonic form of Minor. The unique properties of the other forms are used sparingly and are subject to conditions for their use. In summary, major and minor scales form the fundamental source sets, and therefore the basis of the compositional language in Common Practice music. All the great music of the recognized master composers employed these same constructs as the basic elements of their compositional language. Taxonomy and nomenclature for scale steps and scale components. The Minor Scale, its three forms and their attributes. Construct Major scales on C, G, F, D, Bb. Use half notes, ascending only. Use appropriate stem direction. Label each scale step by scale degree number and mark the half steps. Construct Natural Minor scales on a, e, d, b, g.
Construct the Harmonic and Melodic Minor forms for each Natural Minor scale in Exercise 2. Harmonic Minor, ascending only; Melodic Minor, ascending and descending. Make sure to use the appropriate accidentals and mark the half steps. In Chapter 2 "The Elements of Pitch:Sound, Symbol, and Tone", solfége was explained in its historical and pedagogical context, and as one way of labeling pitch and as a mnemonic device. The principal use of solfége as a pedagogical tool is the aural reinforcement of written music. Fixed DoA solfége system wherein Do is always C, Re is always D, and so forth. : Do is always sung as some form of the pitch name “C.” All other pitches are labeled accordingly. Moveable DoA solfége system wherein Do shifts to the starting pitch of the scale. Other syllables are sung in relationship to this. : Do will shift to whatever pitch serves as the Tonic. All other pitches shift accordingly. Several subcategories have evolved from Moveable-Do and involve the treatment of the Minor mode. The two most prevalent are called La-based MinorA sub-category of Moveable Do. Major is sung beginning on Do, Minor begins on La. and Do-based MinorA sub-category of Moveable Do. Both Major and Minor begin on Do..
La-based Minor: The Tonic in Major begins on Do. The Tonic in Minor begins on La. Ease of use from a melodic orientation in predominantly diatonic music. Half step placement is retained between Major and Relative Minor (Mi-Fa, Ti-Do). Widely used as a part of Orff-Kódaly training. Do-based Minor: The Tonic in both Major and Minor begin on Do. More adaptable when chromaticism in encountered. Has greater harmonic consequence pedagogically for the average student. In use to a greater degree in Music Theory curricula. Each system has its advocates and its detractors. Each has perceived advantages and disadvantages. Having used all known systems, the author has had the greatest student success employing the Do-based model. After an initial familiarization period (because of the use of altered syllables), the vast majority of typical undergraduate music theory students respond to this system. Regardless of which solmization system is used, the purpose remains the same. After a period of familiarization and rote drill, the student will begin to recognize patterns aurally. This is to say that recognition will not merely be aural recognition when heard, but rather, specific patterns will be “engraved” in the student’s mind. These patterns will be solfége-triggered responses. This audio-acoustic trigger response will increase and become more fluent with practice. Fixed-Do as opposed to Moveable Do. La-based as opposed to Do-based systems. In a comfortable register, practice singing a Major scale using syllables, ascending and descending. Gradually increase your tempo. From your Do, sing down, “Do-Ti-La.” Now sing the Natural Minor scale in La-based Minor, ascending and descending. Increase your tempo. Next, sing the same Natural Minor scale, but use Do–based Minor syllables. As an audio-acoustic exercise, think of the patterns, Ti-Do, Do-Re-Do, Do-Mi-Sol, Do-Mi-Sol-Mi-Do-Sol-Do, Sol-Ti-Re-Ti-Sol-Do. Sing what you hear. Confirm at the piano. Defining Modes as heptatonic scales and in historical context. Pre-Tonal (pre-Common Practice) music is generally considered to be music prior to 1587 or16001600 is a convenient benchmark. 1587 is sometimes used as a more specific date. This coincides with the establishment of the Florentine Camerata, (or Camerata di Bardi after its patron), a colloquium of Northern Italian Humanists, Poets, Musicians, and aesthetes. In attempting to “rediscover” and recreate ancient Greek dramatic forms, they developed a new style of music, the “Second Practice,” or “New Style.” This was the origin of Opera.. This period is often referred to as the Modal Era (as opposed to the Tonal Era that is the Common Practice period). The source materials for Tonal practice consist of the Major/Minor duality. Music of this period essentially relied upon Major and Minor scales and their extrapolated constructs as the formative resources for composition. In the Modal Era, the source materials were a collection of scalar constructs called ModesHeptatonic scales used in early music. Also used in post-Tonal music.. Originating as tetrachords in early Greek theory, in early Western music they consisted of a collection of interlocking hexachords, each with specific attributes. In time, as compositional resources evolved, supported by accompanying theoretical principles, Modes became a series of heptatonic scales, each with very specific attributes. Although these were the theoretical basis for early music, modes languished during the Tonal Era. Composers in the 20th-Century, looking for alternative resources to Major and Minor scales, “re-discovered” modes. Modal “flavors” are found in abundance throughout examples of music since 1900. Modes have become an integral resource in the Jazz style as well. Since the mid-to-late 1950’s, modes are considered to be the initial, or primary source scales for Jazz improvisation, especially in the pedagogical practice called chord/scale equivalency.Most Jazz scholars identify the seminal recordings of Miles Davis in the late 1950’s as heralding the advent of modal use in Jazz. There is evidence that trumpet player Don Cherry may have used modal resources earlier in the decade. The Ecclesiastical Modes (or “Church” Modes) were seven-tone scales built upon D, E, F, and G. Each was ordered as an octave species from the modal finalThe modal equivalent of Tonic or keynote. (modal “tonic”). Each also had a re-ordered version wherein the top tetrachord of each was placed below the modal final (Latin: finalis). The original ordering was called the AuthenticThe original ordering of a mode as an octave species from the final. form of the mode, the transposed version was called the PlagalA re-ordering of the mode wherein the top tetrachord is placed below the final. form. These alternate Plagal orderings were not new modes: each pair, Authentic and Plagal, had the same final. A particular form was so labeled based upon the range of the modal melody as well as upon the perceived modal dominant within each form. Originally, modes had specific names. These names reflect regional or place names from the Hellenistic world but were really stylistic indicators. In early church music modes were numbered sequentially. Eventually, the early names were re-used reflecting their early origins. We label modes using these names. In and of themselves, the theoretical modes were considered to have certain flaws in regard to their use in practical composition. These perceived flaws were treated by the use of musia ficta: composers routinely altered pitches to achieve the desired result. For example, the “softening” of the fourth scale degree in Lydian, or adding a Leading Tone to Dorian and Mixolydian.Because of its unique character, Phrygian was resistant to any alteration. In practical composition, the altered version of the mode became the version used. The resulting mixtures of mode and alteration in time yielded new scales, recognized as such by established practice. This was codified in the Greater Modal System. 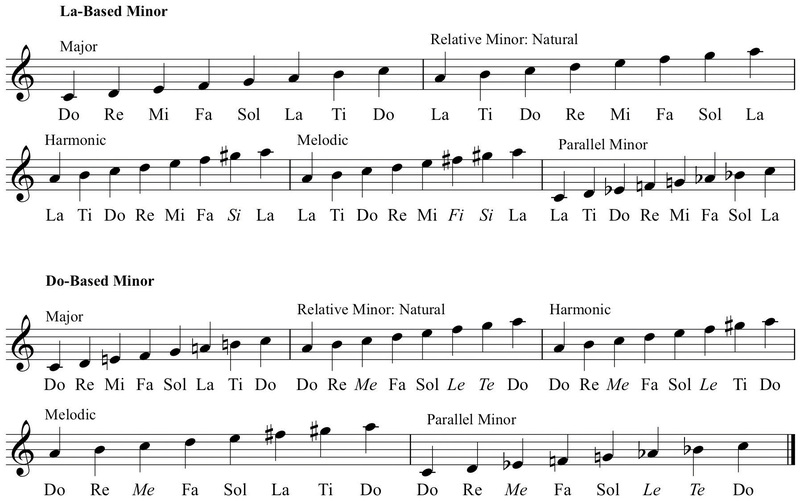 Note that Ionian is the Major scale and Aeolian is the Natural Minor scale. The other earlier modes (again by established practice) gradually polarized toward one or the other of these two forms. Due to the perceived flaws of each mode, they eroded under the weight of their own inefficiency and distilled into either the “Major” mode, or the “Minor” mode. The Locrian mode, while recognized as a theoretical mode was not used in practical composition due to its unstable final resolution.Locrian was not included in the system of modes until 1482 where it was described in the treatise de Musica of the Spanish composer and theoretician Bartolomé Ramos de Pareja. This sense of polarization toward either Major or Minor becomes one useful technique for learning modes and familiarization with their characteristics. The Associative MethodRecognition of modes by association with either the Major or the Minor scale and observing the variances from these. classifies modes as having the same basic characteristics as either Major or Minor and then recognizes the variances. This method is extremely useful in many instances, especially for recognition purposes and as a tool for learning to hear and sing modes.Some advocate a similar system wherein the student is compelled to memorize modes as variances from the major scale. We reject this as being unwieldy and narrow. As such, it cannot be recommended. Modes are labeled by the letter name they begin upon followed by the mode name. A second method is more complete and serves well for the identification of modes, as well as the construction and transposition of modes to other pitches. Observe Figure 3.21 "The Revolving Scale Method for Modes". This diagram of the abbreviated Greater Modal System is projected as a revolving major scale. In other words, it appears to be a C major scale constructed upon successively higher scale degrees. In this Revolving Scale MethodRecognition of modes by their consistent order in the context of the Revolving Major Scale., each successive reordering of the scale corresponds to one of the modes. This modal ordering remains constant regardless of the major scale used. Therefore, it can be used as an “algorithm,” a known value for comparative problem solving, and used as a tool for identifying, constructing, and transposing modes. In Chapter 4 "Key Sense, Key Signatures, and The Cycle of Fifths" modes will be revisited and the Revolving Scale model will be used in conjunction with other tools to perform these tasks. Define modes and understand their historical significance. Understand the Associative Method and the Revolving Scale Method for modes. Construct a revolving Major Scale from C.
Label each revolution with its proper mode name. Perform the same task from G and Bb. Introduction to other commonly used scales. Pentatonic, Whole Tone, “Augmented,” Octatonic, Lydian-Mixolydian and “Nearly” Whole Tone. The fin de siécle period, the crossover period between the 19th- and 20th Centuries, witnessed monumental changes as to how music was composed. By this point in the evolution of Western music, Tonal music had not exhausted itself, but had developed as fully as it could in terms of compositional resources. Composers began to explore alternate scalar resources to Major and Minor. Modes were employed as was the Pentatonic scaleProperly, a scale that divides the octave into five equal portions. In equal temperament, this is most closely approximated aurally by playing the black keys at the piano.. The absence of a Leading Tone in the Pentatonic scale, as well as its folk music associations, made it an attractive, naturalistic alternative to Major and Minor scales. In Jazz pedagogy, two distinct forms of the Pentatonic scale are recognized, called Major Pentatonic and Minor Pentatonic. They are so-called due to their inherently Major or Minor sounding qualities. Composers in this historically transitional period and throughout the 20th Century seemed fascinated by aspects of symmetry in musical constructs.The symmetrical nature of the Pentatonic scale is not overtly obvious. The symmetry is there, but its explanation must be held in abeyance contingent upon other acquired information. In scale construction, this took the form of division of the octave into symmetrical portions. This is apparent in the types of scale patterns that came into common use in the late 19th Century and continued throughout the 20th Century. The Whole Tone ScaleA hexatonic scale comprised of only whole steps that divides the octave symmetrically into six equal portions of two half steps each., properly considered to be a Hexatonic (six-tone) scale, displays numerous symmetrical traits.There are numerous “axes of symmetry” in whole tone scales. Only those pertinent to this discussion are included here. It is comprised of all whole steps, dividing the octave symmetrically into six portions of two half steps each. Since this symmetrical division accounts for six of the possible twelve pitch-classes from the chromatic collection, the other six pitch-classes of the chromatic collection form one other whole tone scale. Each whole tone scale replicates itself when re-ordered in a revolving manner. Pitch-classes remain identical, the “spacing” remains identical, although enharmonic spellings are freely used. Because of these properties there are only two whole tone scales aurally. All other versions are re-orderings of either WT I or WT II, but will assume individual identities according to their use is specific contexts. Another commonly used symmetrical scale is called the Octatonic ScaleAn eight-tone scale. The most common form is the symmetrical division of the octave into eight portions of either alternating half steps and whole steps, or alternating whole steps and half steps.Theoretically, any scale with eight constituent members is an octatonic scale. The versions described here are those most commonly used. In Jazz pedagogy, these versions are called “diminished scales” or “symmetrical diminished scales” because of the structures formed by alternate scale degrees. The two related forms of the Octatonic Scale divide the octave into eight portions consisting of either alternating half steps and whole steps, or alternating whole and half steps. Oct I and Oct II have only three forms each. Figure 3.28 "Octatonic Rotations" shows Oct I with additional re-orderings on successively higher scale degrees. Observe that, after the original form and two additional transpositions have been listed, the fourth ordering is equivalent to the first, the fifth is equivalent to the second, and so forth. The same holds true for Oct II. Two other scales having great currency in 20th Century music are identical in pitch content and identical in their potential origin, but vastly different in context and usage. Figure 3.30 "“Nearly” Whole Tone and Lydian-Mixolydian" compares the Whole Tone scale to the “Nearly” Whole ToneA six-tone scale that is an altered whole tone scale. One pitch is altered to create a single half step in the collection. In this chapter it has been listed half step first. In other sources, there are other orderings. Hexachord and the Lydian-DominantA heptatonic scale wherein the first tetrachord resembles Lydian mode (raised 4) and the second tetrachord resembles Mixolydian mode (lowered 7). scale.Lydian-Dominant is only one label for this scale and is used here as a convenience only. Other names are Lydian-Dominant (common to Jazz pedagogy) or (the proper name) the Overtone Scale. These additional names will not acquire meaning until the student has acquired additional information. Observe that, despite differing orderings, the pitch-class content is identical for the “Nearly” Whole Tone and Lydian-Dominant scales. The Nearly Whole Tone hexachord is just that: all whole steps except for an initial half step. The Lydian-Mixolydian scale is so-named because the first tetrachord resembles the first tetrachord of the Lydian mode, and the second tetrachord resembles the second tetrachord of the Mixolydian mode. Both scales have their potential postulated origin in the naturally occurring acoustical phenomenon called the Overtone (or Harmonic) Series, discussed in Chapter 6 "Chords".The Nearly Whole Tone hexachord is the source set that forms the basis of Russian composer Alexander Scriabin’s Mystic Chord, an important component of his personalized compositional syntax. These are but a few of the many scales that have been recognized and used in contemporaneous theory and composition. While the primary focus of the student should be upon Major and Minor scales at this juncture, at least a passing familiarity with other scalar constructs is desirable. One cannot begin to understand and perform early music without an understanding of modes. Much music since 1900 has been composed using modes or, at least, modal “flavors.” One cannot improvise credibly in the Jazz style without understanding and employing modes. These same remarks may be made concerning the other scales discussed. One cannot begin to understand and perform modern music without an understanding of these various scale patterns. In time, with the proper investment of effort, these scales (and others) will open new worlds in a deepening musical experience. Whole Tone Scales, Octatonic Scales, Augmented Scales. “Nearly” Whole Tone and Lydian-Mixolydian. Using this as a model, construct the same on F, G, Eb, A, and B.
Construct WT I and WT II from F.
Oct I and Oct II from G.
Augmented I and II from Eb.